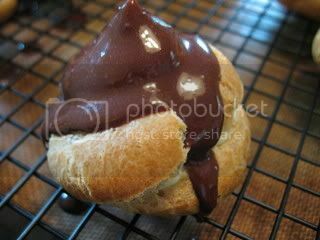 However, I was excited to see that this month's recipe, chosen by Meeta and Tony, was for chocolate eclairs. 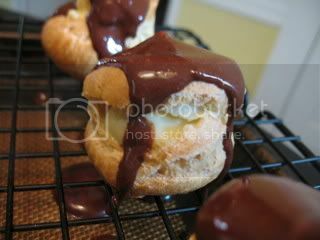 I've never made eclairs, so this would give me a chance to try my hand at pate a choux dough and pastry cream. I got that new teaching job a few weeks before school started, and I was frantically trying to get my classroom ready and figure out what the heck I was supposed to be teaching. Still, I remembered the August DB challenge in the back of my mind and looked forward to a day off so I could make those chocolate eclairs. And then yesterday, I realized that August 31 was the posting day. And I hadn't made the eclairs yet! I thought for sure that I would do them yesterday. I had planned on it. I had to bake that apple tart tatin because the farmers' market apples were expiring on the counter. I didn't feel much like baking eclairs after that...and after cleaning, doing laundry, and making a webpage for my classes. There is, of course, an advantage to waiting until the last minute...seeing what everyone else has done! And learning from their mistakes. I chose to keep the glaze (which was time-consuming & sort of redundant), while making a ginger pastry cream. For the first batch of eclairs, I piped some strips to form the traditional "long johns" and some spiraly circles. The strips didn't puff up enough to become finished eclairs (they looked like fingers), but the circles came out nicely. I did all larger circles for the second batch, and I thought they turned out the best. Also, several people wrote about how their shells fell after taken out of the oven. The remedy, it seems, is to bake them longer than the 20-minutes as the recipe says. I baked mine 10 minutes longer, checking after 5 minutes to make sure the bottoms weren't burning. I prepared the cream first, to give it time to chill while I baked the eclair shells. As the shells were cooling, I made the chocolate glaze. Bring the milk and ginger to a boil in a small saucepan. Meanwhile, in a medium heavy-bottomed saucepan, whisk the yolks together with the sugar and cornstarch until thick and well-blended. While whisking, drizzle about 1/4 cup of the hot milk into the yolks to temper them. Whisking all the while, slowly pour in the remainder of the milk. Put the pan over medium-low heat and, whisking vigorously & constantly & thoroughly, bring the mixture to a boil. Keep boiling & whisking for 1-2 minutes, then remove the pan from the heat. Then, whisk in the butter, stirring until they are fully incorporated and the cream is smooth & silky. Transfer the pastry cream to a small bowl. Press a piece of plastic wrap against the surface and refrigerate until ready to use. In a heavy bottomed medium saucepan, bring the milk, water, butter, sugar and salt to a boil. Once the mixture is at a rolling boil, add all of the flour at once, reduce the heat to medium and start to stir the mixture vigorously with a wooden spoon. The dough comes together very quickly. Do not worry if a slight crust forms at the bottom of the pan, it’s supposed to. You need to carry on stirring for a further 2-3 minutes to dry the dough. After this time the dough will be very soft and smooth. The dough should be still warm. It is now ready to be used for the éclairs. Preheat your oven to 375 degrees F. Divide the oven into thirds by positioning the racks in the upper and lower half of the oven. Line two baking sheets with waxed paper, parchment paper, or silicone baking mats. 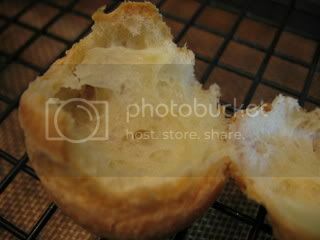 Fill a large pastry bag fitted with a 2/3 plain tip nozzle with the warm cream puff dough. 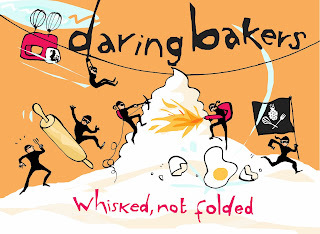 Pipe the dough onto the baking sheets in long, 4 to 41/2 inches chubby fingers. 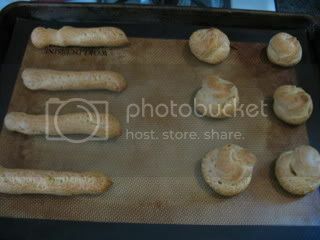 Leave about 2 inches space in between each dough strip to allow them room to puff. The dough should give you enough to pipe 20-24 éclairs. Remove the shells from the oven and transfer to a cooling rack. The éclairs can be kept in a cool, dry place for several hours before filling. If the chocolate glaze is too cool (i.e. not liquid enough) you may heat it briefly in the microwave or over a double boiler. It is best to glaze the eclairs after the glaze is made, but if you are pressed for time, you can make the glaze a couple days ahead of time, store it in the fridge and bring it up to the proper temperature (95 to 104 F) when ready to glaze. Place all the ingredients into a heavy‐bottomed saucepan and bring to a boil, making sure to stir constantly. Then reduce the heat to low and continue stirring with a wooden spoon until the sauce thickens. 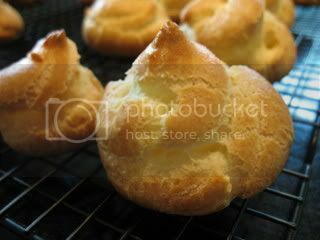 The puffs are hollow in the middle, so I just used my fingers to gently nudge the top apart on the circles. The glaze should be barely warm to the touch (between 95 – 104 degrees F, as measured on an instant read thermometer). Spread the glaze over the tops of the éclairs using a metal icing spatula. Allow the tops to set and in the meantime fill the bottoms with the pastry cream. Pipe or spoon the pastry cream into the bottoms of the éclairs. 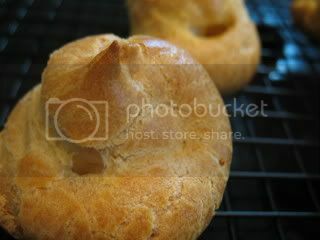 Make sure you fill the bottoms with enough cream to mound above the pastry. Place the glazed tops onto the pastry cream and wriggle gently to settle them. Ooh, I've got to try that ginger pastry cream. Your last photo is especially gorgeous. Triumph! Oh! I hadn't seen ginger yet. What a good idea. They look great. Ginger!! I'm so jealous. The double chocolate just didn't do it for me. Wow, Kelly. I'm really impressed. They look amazing!